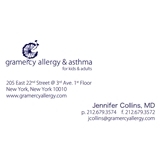 Gramercy Allergy & Asthma (New York) - Book Appointment Online! We are thrilled you've chosen us to be part of your medical team. Please stop taking antihistamines (Benadryl, Claritin, etc.) 48 hours prior to your appointment. Please also complete the first page of registration forms. It's my pleasure to provide comprehensive care in all areas of allergy & immunology for children and adults. For the past 10 years I’ve been treating patients with allergies, asthma, and immune issues. My areas of expertise are skin allergies, chronic sinusitis, nasal polyps, asthma, food allergies, and all types of seasonal allergies. I believe that listening carefully to the patient and working collaboratively with the patient’s primary doctor is the key to finding a successful treatment plan. My clinical interests include chronic sinusitis, aspirin allergy, asthma, drug allergy, eczema, food allergies, and immunodeficiencies. Note: You will be seen by either Dr. Jennifer Collins or Dr. Meng Chen depending on availability.